I’ve worked for NIKE for over 25 years and all within the U.S. I’ve traveled to the big cities of New York, Los Angeles, Chicago and Houston. I’ve traveled to the small college towns of East Lansing, Stillwater and Pullman. It has always been important to know your business, know the markets where you sell and most important, know who’s buying your stuff. So this week when I set out to do my first travel in China I did a bit of research. Let me share some interesting facts with you. By the way, my facts are from wikipedia so if you disagree, feel free to change them. China and the U.S. are roughly the same size – The U.S. is 3.8 million square miles and China is 3.7. The population is where we really separate. The U.S. 317 million, China 1.4 billion. The largest city in the U.S. is New York, the largest in China is Shanghai. The population of the four major markets in China look like this – Shanghai 22 million, Beijing (the capital, by the way) 20 million, Guangzhou, 12 million and Hong Kong, just over 7 million. It was a real eye opener for me as I started out on travel, visiting cities where we focus our business. Traveling to one market that is larger in population than that of New York, New Jersey, Pennsylvania and Connecticut combined is impressive to say the least. 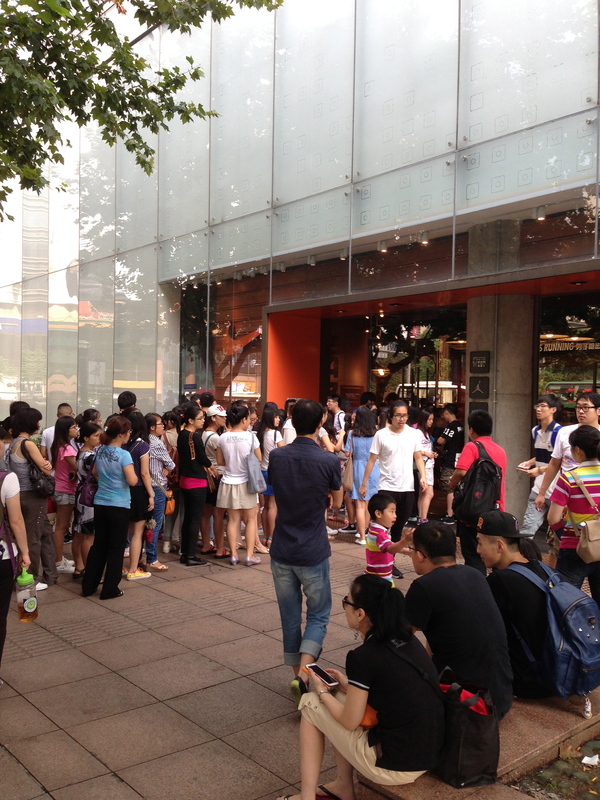 I’ve been making my way around Shanghai and visiting different stores where NIKE is sold but was really moved one morning as I happened upon one NIKE store while out for a run. I first saw the NIKE ad on the side of the building and then saw the big orange swoosh. I’m super proud to say I work for NIKE, I grew up with it. I’m always moved when I see the swoosh around the world knowing that it all started in my backyard – my hometown. And nothing was more moving than seeing it ahead of me on the streets of Shanghai. As I approached the front of the store, I was met by a swarm of people waiting to get in. The line, started at the door and worked its way around the corner and down the block. I had to know what was happening, it’s my business, right? Not caring that I was sweating, wearing a tank and running tights with many people staring at me like I was a freak show, I jumped up on a cement wall and starting snapping photos with my phone. I made my way up to the front door and asked security what the line was for, “Air Jordan 4” he said with confidence. I loved it. My travel outside of Shanghai started with checking in at the airlines of China Eastern. Not to be confused with China Southern, China Air or Air China. I had to check my itinerary 3 times to make sure I went to the right counter for check in. Apparently, no need for any of that fancy branding work to differentiate the airline industry of China. I flew China Eastern from Shanghai to Beijing. Beijing is north of Shanghai, about a 2 hour flight so I was curious why not China Northern? Beijing is a great city. It’s clean and seems very organized, I think it’s a government thing. 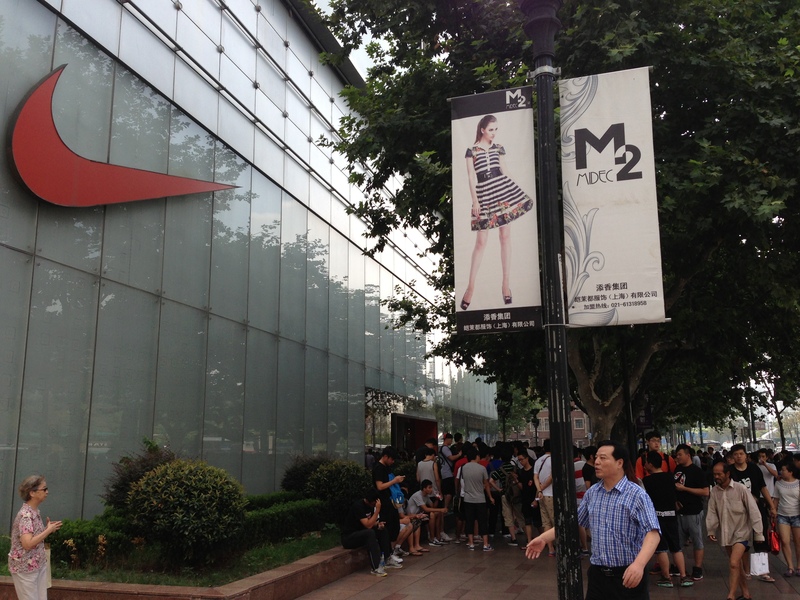 We visited retail and saw where and how NIKE looked in the capital city. It was just as impressive. After a day of meetings, the NIKE crew went to dinner at a newly opened restaurant called Da Dong. There are lots of comments I could make here but let’s make this an interactive thing – I’ll give you a minute to enjoy your favorite Da Dong joke. Finished? Good. Both Beijing and Da Dong are famous for their roast duck.The food was delicious. 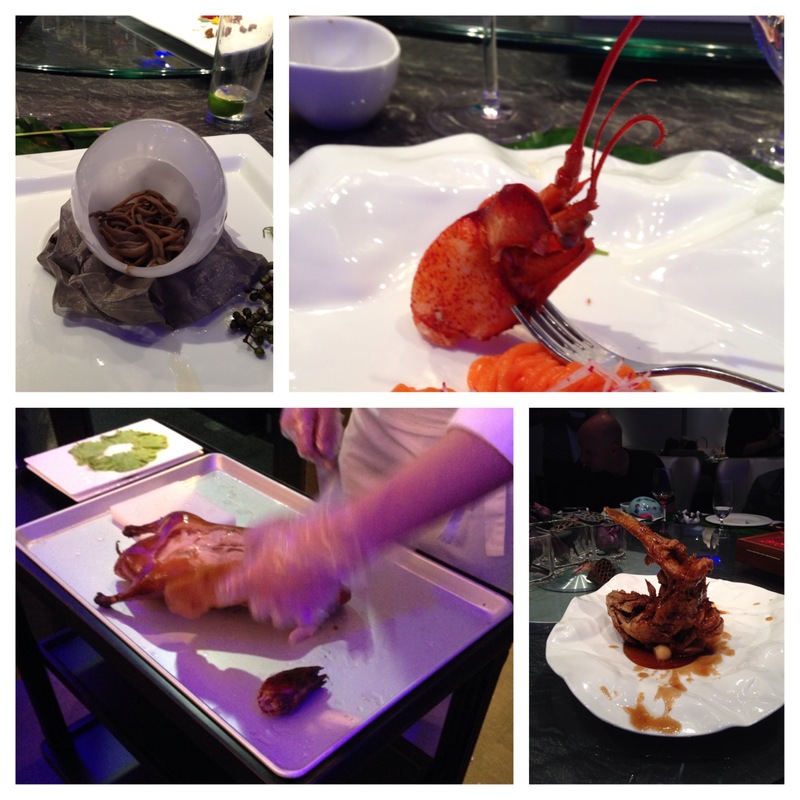 I had sea urchin served in an ice bowl, lobster pasta, duck (sorry UofO fans) and fried fish. From Beijing we traveled to Guangzhou on China Southern airlines, which makes sense to me as it is south of Beijing and south of Shanghai. 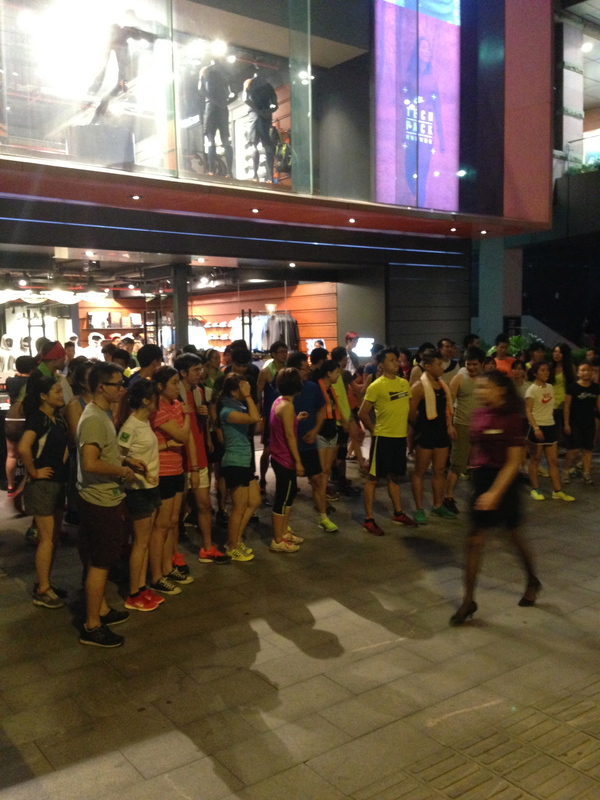 We arrived just in time to see a running club that meets once a week outside of the NIKE Guangzhou store for a 5k. The runners were mostly in their 20s, they met outside the store for warm-ups and with music blasting it was more like a party than a run. Something to know, these young people did not grow up playing sports. There are no organized sports in the China school system. If you’re pegged as an athlete, it is done at a young age and you are sent to a specialized school to develop your skills. For these young runners, running was a required test for school – a pass or fail and they hated it. But now, It’s a choice that they’ve embraced as a way to get healthy, have fun and meet people. I loved their energy. After my week of travels and realizing I most likely will not get to meet all of the 1.4 billion people of Greater China, I was energized by the differences in the cities I visited and the cities where I will go to next. Not every day can be wontons and wowos (Chinese candy). Spoiler Alert – If you chose to follow me as I blog my way through China you have to read the bad with the good. You have to allow me to be completely transparent in my adventures and sometimes living in China is hard and I need to vent. Some days China smacks you right in the face. I had to leave the office early one day last week to go the Shanghai Police Offices to register as a permanent resident. Yes, I had to go the the Police Office to show them my face, have my picture taken, and sign a document. Again, NIKE administration had someone there to help me through the process. Kenny, my driver, picked me up from the offices and drove me about 30 mins outside of Shanghai to the Police Office. When I arrived, someone named Jack texted me from an unknown number telling me to meet him on the 3rd floor. Kenny was not allowed to go in with me. As I made my way up to the 3rd floor, I was thinking, how will Jack know who I am? How will I find Jack. I don’t know Jack. As I slowly made my way up the escalator, with every step packed with at least 2 people, this young man was waving papers at me and calling my name. He quickly escorted me to the front of a line and put me in front of an officer. Sweat began to form on my brow. The crabby officer, no one here in China smiles, had my passport and other documents in front of him. He motioned for me to look into a camera, snapped my picture, handed me a form to sign and waved me away. Jack, asked something in Chinese and the officer gave me a piece of paper with my picture on it and told me not to lose it. This was my temporary travel document so I could travel within China. When I asked about my passport he said it would be returned upon the approval of my residency. Okay. That feels strange. Who does this? China. Kenny drove me home and because it was the day before another holiday here in China the traffic was incredible. It took us 2 hours to get back. I had not had lunch and it was around 5:30p so I asked Kenny to drop me at an Italian restaurant, walking distance from my apartment. The weather was nice so I asked to be seated outside. I enjoyed a nice glass of red wine and some pasta while a herd of bugs enjoyed biting my ankles. I had at least 10 huge bites when I got up from the table. As I walked back, something wet dropped from above and hit the back of my neck and ran down my shirt. Not wanting to look up, I told myself it must just be condensation from someone’s air conditioning unit. Right? When I walked into my apartment, I looked over at the washing machine that I have nick-named “Little F’er” as it has given me trouble since day one. It was flashing “E04” on the screen and water was coming out from underneath and was flooding the kitchen floor. Perfect. Exactly what I wanted to come home to. I quickly grabbed towels to clean it up, called the front desk where I was told that due to the holiday, it would be 2 days before anyone could come and look at it. I explained that my clothes were locked in the “Little F’er” and I needed help getting them out. They sent an engineer and after some time, he was able to get the door unlocked and I spent the next hour dealing with dripping wet clothes. I’m going to bed. I’m going to brush my teeth with bottled water because the water supply system in China cannot be trusted and go to bed. That was my plan. Get in bed and watch a little good old American TV from the Slingbox website that Greg had hooked up so he could watch the Duck games once he arrives. Nope. Not tonight. I got a blank screen as I tried to log on. Lights out. I went to sleep at 8:30. I awoke the next morning and thought I would scramble up some eggs that I had purchased. I broke open two eggs and saw that the yokes were tangerine in color. Strange, I thought. As I began to scramble them and broke the yokes open, blood ran out. Right down the disposal went the eggs and I started to cry. As I headed to work, I ran into a co-worker who noticed I was down. “Come on. Let me buy you a coffee.” We sat and chatted and I explained my last 24 hours. He said “You’re having a China day.” He explained that it happens to the best of us. He shared that he has lived on 4 continents, and lived in China for the last 4 years and China is the hardest place to live. You’re okay. It’s normal and it’s really hard here sometimes. Just hearing someone say it made me feel better. Word got out around the office and my NIKE teammates rallied around me throughout the day sharing their “China Day” horror stories. They shared with me ways to get through it, told me to hire an Ayi to do my laundry and where to buy my eggs. Growing up in a large family and being number seven of eight kids, I learned at a young age to speak up. I learned that if I was ever going to get a word in, I better have something important to say. I learned that I had better say it loud, have a point, get to that point quickly and know when to wrap it up. Each night at our dinner table, the conversation was typically sports. With 5 brothers, 4 who played football, we talked football. Well, not we, my dad and my brothers. When my mom saw what was happening, that my brother Joe and the girls were being left out of the conversation, she initiated The Family Conference. If one had something of importance to share, and let me tell you importance was loosely defined, they called for a conference and when one was granted, everyone else at the table had to remain quiet while the storyteller spoke. I learned quickly, that your story had better be good to hold the attention of the older siblings or you may just get whipped with a wet towel while doing dishes. I credit my mom and The Family Conference for giving me the confidence for public speaking. It has helped me through many presentations. But NOTHING could have prepared me for what I was asked to do the first day on the job here in China. 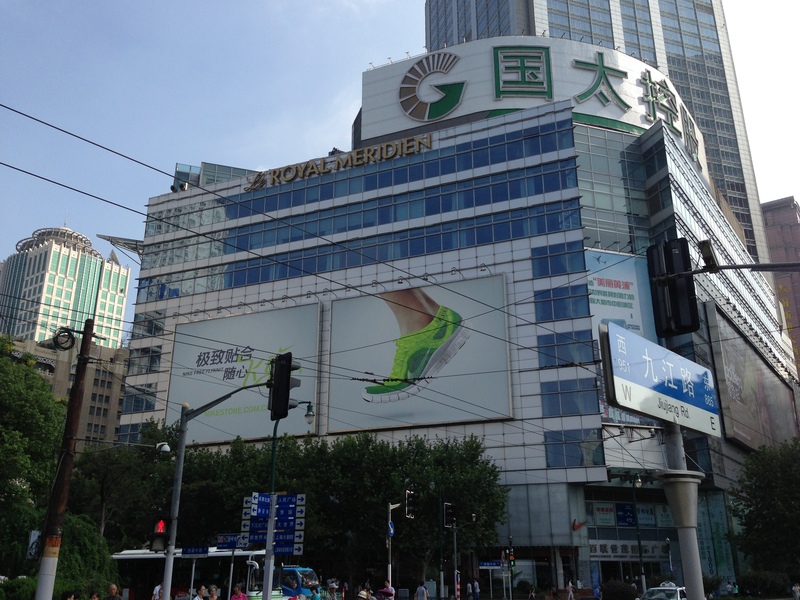 I received an email the week prior to my arrival sharing that on Monday, September 16, NIKE would be announcing a 3 year partnership with the Shanghai International Marathon at a press conference. The email continued, stating that our PR team had drafted a speech that the Shanghai Government was reviewing for approval and would I like to deliver the speech after the official signing of the agreement. Absolutely was my response. No way was I going to say no to that opportunity. I have a blog to write. So, on Monday morning, at breakfast, I was briefed and given the protocol for the press conference. I was escorted to a V.I.P. room where the Director General of Shanghai Administration of Sports and the President of Shanghai Sports Federation and I were seated at the front of a room on gold, velvet couches, smiling at each other while cameras flashed in our faces. I’m feeling like Madeline Albright and (insert any countries government official) at the start of any peace talk. We shared a brief exchange of small talk delivered through an interpreter all the while, cameras flashing. When the Director General had had enough, he raised his hand, said Xie Xie (thank you) and we both rose from our thrones to exchange gifts. He gave me a book on the history of sport of Shanghai and I gave him a NIKE Fuel band. When I gave him the band, he reached in his pocket and proudly pulled out a pedometer that he uses. Channeling my dad, the ultimate charmer, I quickly grabbed his pedometer and stated “you have to trade that in for the NIKE Fuel Band.” As his interpreter quickly shared with him my comments, he laughed a hardy laugh accepted the Fuel Band and refused to take back his pedometer. From there, we were led into a room with a stage where the signing and speech would take place in front of my new NIKE teammates, media from around China and other government officials. No pressure. We were called to the stage, seated at a table draped in a red tablecloth, with 4 sets of agreements placed in front of us we did the official signing. I was disappointed that I had to use the same pen to sign all 4 agreements. 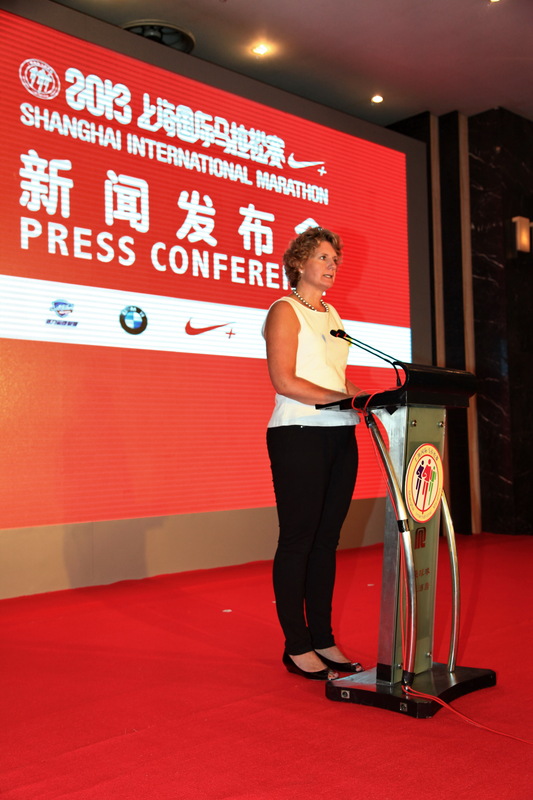 After the signing I took to the podium and delivered the pre-approved by the government script about NIKE’s excitement and commitment to the Shanghai International Marathon. Knees shaking I delivered each paragraph and then waited as the interpreter repeated the comments in Chinese. I looked out to the audience and thought to myself – square melons. Thursday marked the Mid Autumn Festival, a national holiday in China. The festival is for lunar worshiping and moon watching where mooncakes are offered between friends or at family gatherings. 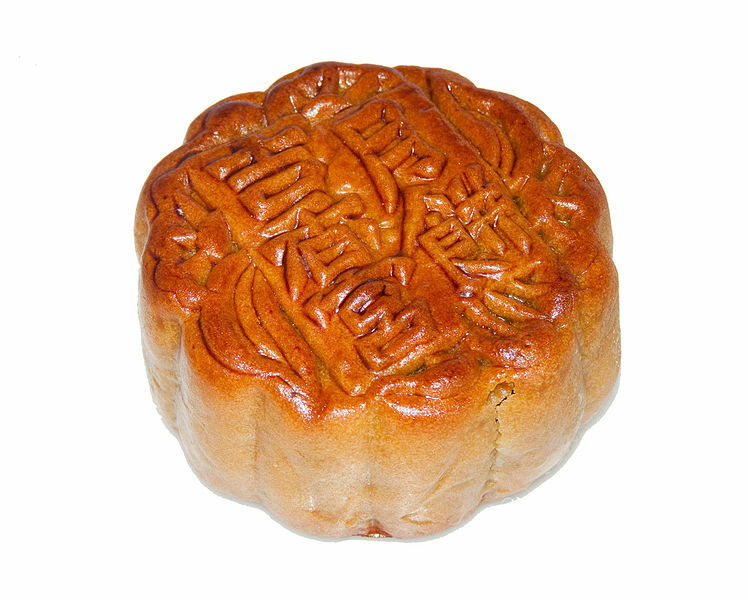 Typical mooncakes are round pastries and are filled with fruit or meat and usually enjoyed with tea. It is customary for business professionals to present them to clients as presents. 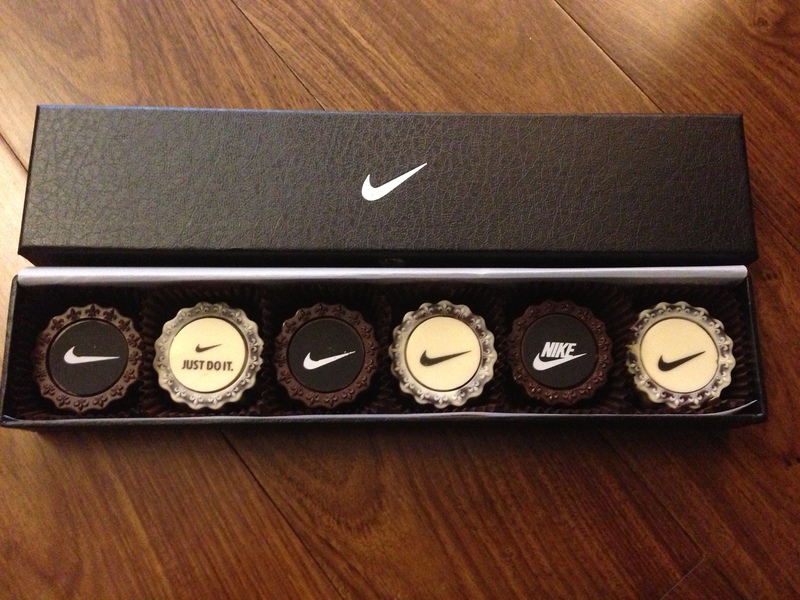 NIKE of course put their own twist on the mooncake, offering a customized, chocolate variety. I was given a box and decided to enjoy mine with a nice bottle of delicious red wine. That evening, I toasted the moon, ate some chocolate swooshed mooncakes and gave a little shout out to The Family Conference. *learn more about the meaning of square melons on the home page of this blog. Allow me to set the scene. 4 years ago, in a small farmacia (that’s pharmacy) in Sitges, Spain, 3 kids and a husband hid behind a display of sunscreen while one confident, bold woman acted out the need for “Imodium AD” to the pharmacist. I credit my acting skills to Ms. Trustee, my drama teacher from Mt. View Junior High, and more recently, the improv class offered by On Your Feet of Portland. Skills that have served me well as I make my way through international travels. It’s not always pretty, well, truth be told, it’s never pretty and can be embarrassing to The Saints when a pharmacist just watches my performance, turns away, goes into a back room and comes out with the spanish version of Imodium AD. Who knew he spoke inglés? His loss. He missed my next act, “swimmers ear” preformed to the female pharmacist on duty later in the week. My acting skills have come in handy again this week as I set up house in Shanghai. I made my way around the small store located near my temporary apartment just fine. I only had a few items to purchase and did so without needing any assistance. My list included, a small box of cheerios, non-fat milk, a jar of Adam’s Natural Peanut Butter, a loaf of bread (it’s really a half loaf as it’s made fresh, with no preservatives, so you’ll need to eat it fast) and some laundry detergent. And okay, fine, I also purchased some delicious chocolate, imported from Switzerland. Hey, I’m in transition so back off. The total came to 603.10 Renminbi or RMB, the official currency for Mainland China. Because the money looks like play money to me and not yet real, I pulled it out of my wallet and willfully handed over the colorful bills. It wasn’t until I walked out that I pulled up my currency calculator app to see that I had just paid $99 for my small bag of groceries. 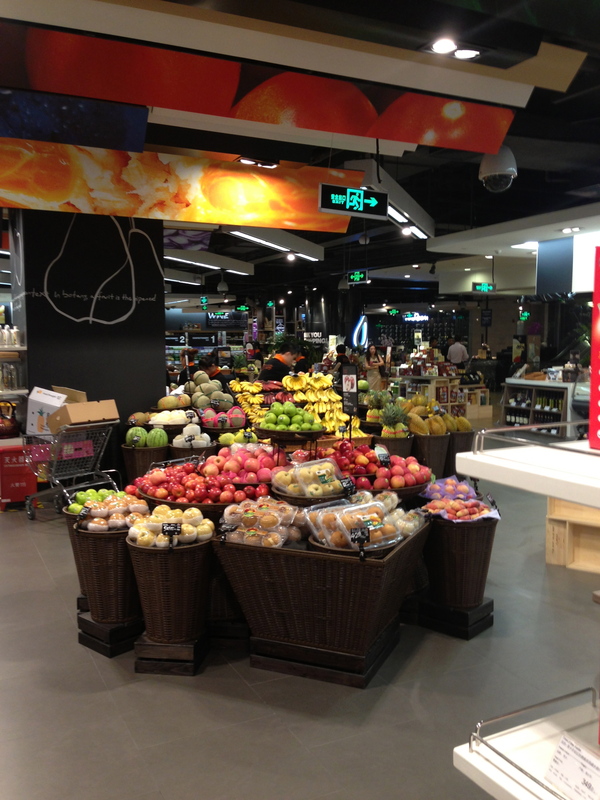 I realized, I had just shopped at the equivalent 7-11 of Shanghai. I came home to find two housekeepers cleaning the apartment. Perfect. I needed some help in figuring out how to work the washer. I motioned one over to the machine and pulled out the laundry detergent from the bag and starting in on my acting skills. I opened the drawer to where you would pour the detergent and pointed to the three options or small wells. I’m thinking, one for detergent, one for bleach and one for softener. She was very nice, smiling and nodding, not understanding anything I was saying but watching as I acted out the pouring of the detergent. She called over her co-worker who then called, using a walkie-talkie, their supervisor. He arrived and four of us stood around staring at the three options. Finally, after they seemed to be ignoring my fine acting skills, the supervisor, turned the machine on, watched where the water came in and pointed to well #1 as the place to pour the detergent. After they left, I stood staring at the front of the machine. I had my clothes loaded and the detergent poured in well #1. I then just stared at the front of the machine. Nothing in english. No pictures, really. Just Chinese symbols and some numbers. So what’s the harm in trying. I hit a few buttons and ta-da, water starts flowing in and the machine starts going. Great right? Well, that went on for about an hour when I heard the beep, signaling it was done. I went to check and the clothes were pretty wet, so I hit what I thought was the button for “spin cycle” and the wash started over again, locking the door. 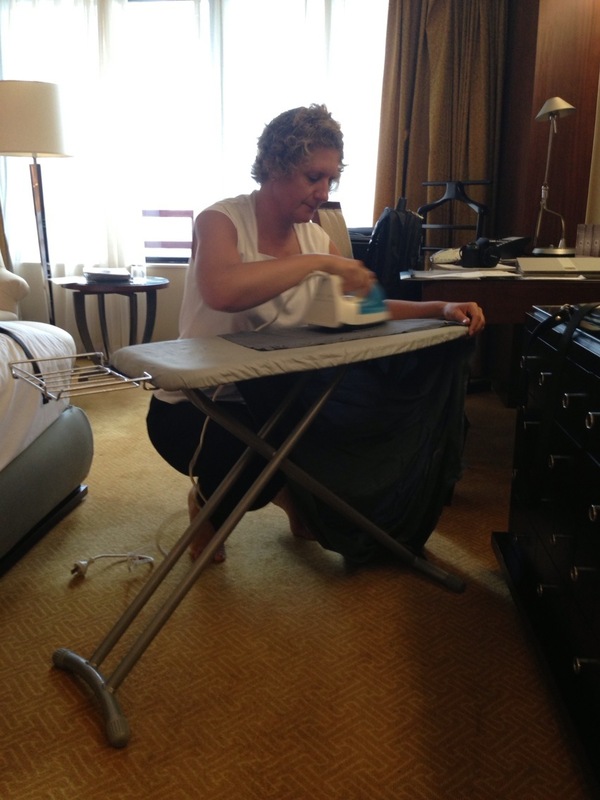 This went on for three tries – all the while, my clothes held hostage for 5 total hours. They are all very clean and hanging all over the apartment, taking days to dry. I’ll act out “spin cycle” again today when housekeeping returns. I wandered the city this week in hopes of finding a more cost effective and reliable place to shop. I like the idea of the store front shops on the back streets. They seem completely authentic. But for someone who has germ issues of the most basic sense, this just seems like too much, too soon. And then I found it. 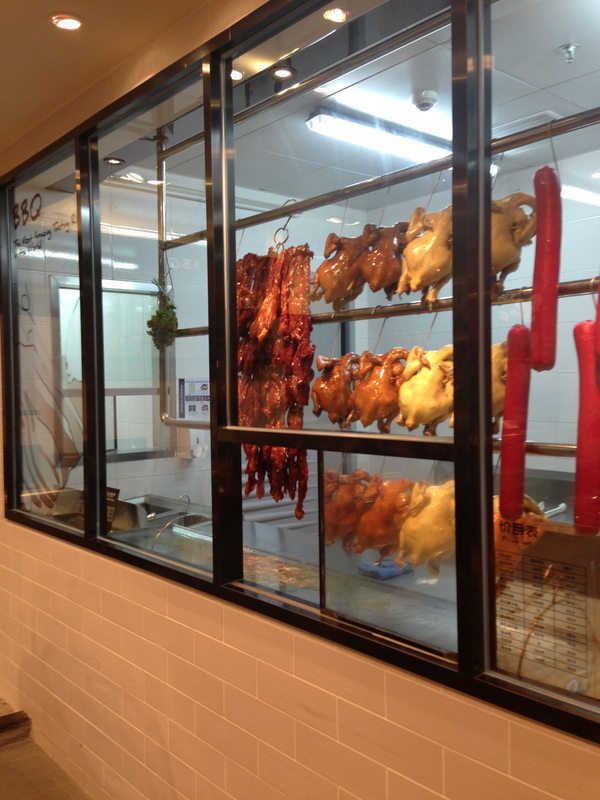 Just a block away from where our permanent apartment will be is the newly opened Ole Market. It’s the New Seasons not quite Whole Foods I was looking for. It’s new. The aisles are wide and clean. 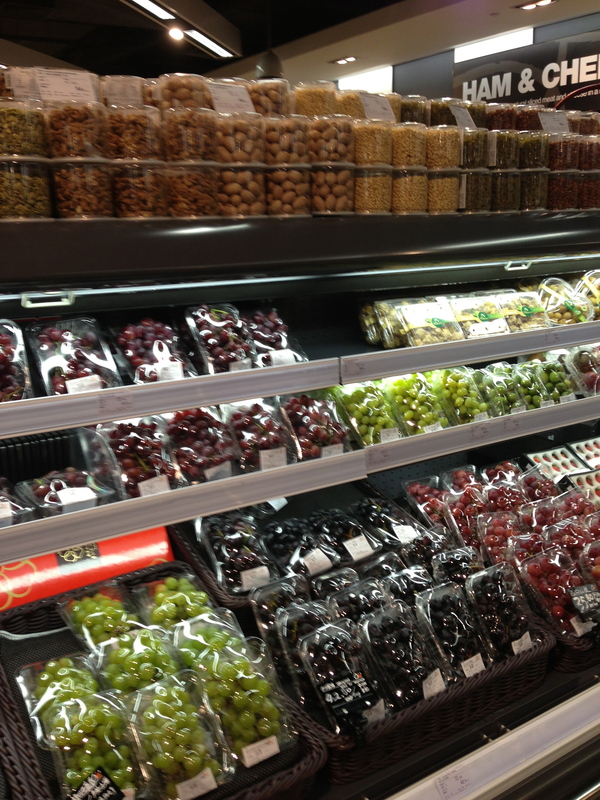 They carry food, wine, cheese, candy, imported meats and fish. They have a coffee bar and host wine tastings and cooking classes. The prices are comparable to what I would pay in Portland. It’s perfect. I’ve been back several times if not to purchase anything but for us to get to know each other. I’m sure they’ll remember me in both the cosmetics section where I acted out “make-up mirror” and at the coffee bar where my performance of “french press” was award winning. Originally, I was to be named Julianne Marie after a nun from Holy Redeemer parish in North Portland where my parents attended. The week I was due, my dad was in Alaska at a church sponsored Cursillo retreat. My mom, together with my grandma was managing the house with six kids who were coming off a case of the chicken pox. Nice timing dad. So with my dad away, a one-year-old with a severe case of the chicken pox and five other kids who demanded attention, a nine month pregnant with her seventh mom did what any good catholic would do, she prayed. She prayed to Mother Mary Rose, the Foundress of the Congregation of the Holy Names of Jesus and Mary. She prayed that if she could just hold off going into labor until my dad returned and that if she had a girl, she would name the baby after her. Now that’s a lot of “ifs” and knowing my mom would not mess with the Foundress of the Congregation of the Holy Names of Jesus and Mary she prayed and her prayers were answered. My dad arrived home and two days later I was born. Just one problem in the promise to Mother Mary Rose—my older sister was named Mary. Not a problem for my mom, she flipped the names and I was christened Rosemary. And for my entire life, it has been important to my mom that my name not be shortened and that I never be called Rose. Today, I received my Chinese name. You are given a Chinese name to use on your business card and when filing papers with varying bureaus you will do business with while living in Shanghai. And again today, I was faced with making a change to the original offering. This caused me to pause. No offense to my sister Mary, but I’ve been explaining the Mary vs. Rosemary naming my entire life. I’ve been mistaken for Mary on one occasion that involved a long, uncomfortable hug, which if you know me, know I’m not really a hugger and in contrast, Mary is someone you would go to if you ever needed a hug. I sent back an email requesting to use the name Rose. Note to mom – I know. It’s not ideal, but what was I to do? And so, while doing business and completing official documents with varying bureaus within China I will go by 玫瑰 (Lu Si). Although my mom and I may not be comfortable with the shortening of my name to Rose, I do like the idea of being called Lucy. Imagine all the fun Lucy will have while spending the next few years in China. Now, who will be my Ethel? Leave it to the Brock family to host a going away event where “bring your favorite Chinese take out” was the theme. A week of goodbyes where there was plenty of food and drinks shared with great friends and family. With every gathering we reminisced and talked about what a great adventure Greg and I were about to begin and everyone had advice. My brother Ray’s advice was “travel safe and watch your six.” Now, Ray works closely with the military so I was sure it had something to do with the call of duty. I of course said thanks and Googled the term. It’s used mostly by air force pilots and means to watch your back. With 12 o’clock being directly ahead of you, your 6 o’clock is behind you. Your wingman watches your six while you’re busy watching your 12 o’clock and I assume your 3 and 9 o’clock. On Saturday night we had dinner with a few of our closest friends. They took a different approach – they, together with our kids put together a list of things we would not miss while living abroad. Here’s a few – Overly nice, chatty Oregonians. Man-dal footwear with jean shorts. The new food services offering at NIKE. Moles overtaking the front yard. Finding out Jeopardy is a rerun. Big Al’s. The neighbor’s dog. The branding by local news media of every winter’s “storm.” And, the over-rated status of Voodoo donuts and those who feel the need to purchase them and carry them on to flights out of PDX. I received advice from work folks as well. From those who have lived overseas the message was unanimous – this will be the greatest experience of your lives. Embrace the culture, travel the region as much as possible and buy your booze at duty free. Advice came from those in leadership roles at NIKE – respect the culture and deliver the fundamentals. Use your 26 years of NIKE experience and share NIKE’s culture. Remember it’s their country, learn how they do things and give them the confidence to get it done. Don’t “F” it up. We had great goodbye meals at some of our favorite restaurants. We took in gin & tonics and the fried chicken at Irving Street Kitchen. The heavy on tequila, margaritas and the Speedy Gonzales burrito at Pepitas. We met co-workers for drinks at Kask and then walked over to Tasty and Alder for delicious plates. We enjoyed gin & tonics, pinot noir and tagliatelle at DeCarlis in Central Beaverton. We had beers and sliders at Cafe Murray Hill. My mom and I had coffee and omelets after church this morning at Tom’s Pancake House and Greg and I went to our favorite Chinese restaurant, Lucky Strike tonight for Kung Pao and beers. Detox starts tomorrow. Our kids may be our biggest supporters through all of this. They toasted us at dinner and each one has reached out to say how proud they are and how cool it is to be able to say “our parents are moving to China.” Matt has checked in several times from Houston where he lives, to make sure we’re okay as we finalize things this week. Meredith has called and sent messages in support from Uruguay where she is working this summer on a project for University of Oregon. Katie did a drive-by on Friday as I was doing the final clean out of my closets and packing the last bags. We sat on my bed chatting and she asked how I was doing. I said I’ve got tears welled up and could cry if I wanted but that I was also really excited and my stomach has butterflies. That’s when she turned to me and very clearly stated “It’s pre-game. You’ve got pre-game jitters. As soon as you get there and they hand you the ball you’ll be fine. You’ll be great.” She’s right. That’s exactly what it feels like. It’s pre-game. The game starts tomorrow as I fly out to Shanghai. “You’re just big boned.” That’s what I’ve been told my entire life. A statement my mom told me whenever I complained about being bigger than the other kids. The only person taller than me in Junior High was my brother Ray, and that just got awkward at dances. I was reassured when we went back to school shopping and nothing seemed to fit or if I ever said I was fat. “You’re just big boned,” an attempt to make me feel better about myself. I get it. I was born with the genes of a German father and a Dutch mother. I’m big boned. I’ve been this tall since I was 14 years old. I always played center in basketball. I was a middle blocker in volleyball and loved playing catcher in softball. I’ve embraced my size. Kind of. I did once respond to the question “how tall ARE you?” with “5’12″” as I thought it sounded better than 6 foot. All of this assurance has come back to life this week as I begin to pack for our move to China. Every co-worker who currently lives in China or has just moved back has warned me “the clothes won’t fit you.” They’re not just saying this to me because I’m big boned, nothing fits them either and they’re normal sizing. In China, all the stores stock asian sizing and why not, It’s China, the Chinese are small boned. 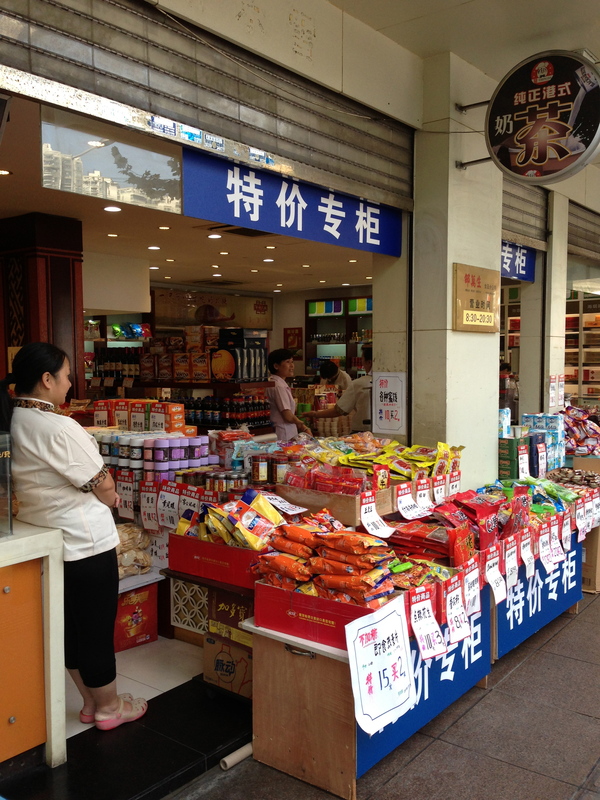 I’ve experienced shopping in China. 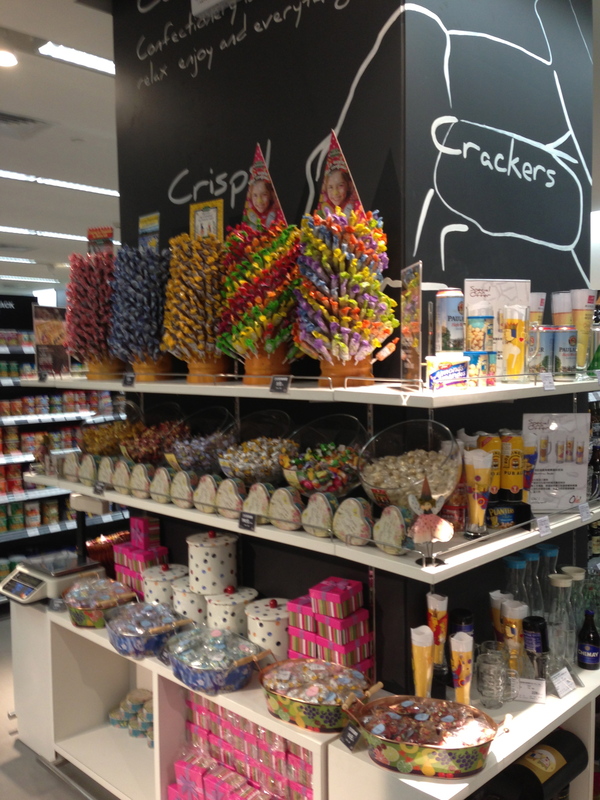 I can feel the uneasiness of the store clerks as I walk into the store. There are some stares and always the “sizing you up” look. In one case, I was gently escorted to the door as the woman just shook her head if I looked in the direction of anything outside of scarves. Because I’m a control freak and perhaps a bit over organized, I’ve taken inventory of my current wardrobe. I’ve evaluated, edited, eliminated and made a list of things I needed to purchase. I’ve made several trips to the mall and the FedEx guy is now invited to my going away party. And it’s not just clothing I’m worried about it’s also footwear. I wear a women’s size 12 – not an easy find even here in the states. Once while attending the Women of Sports Foundation dinner in New York, I was seated next to a WNBA player who shared with me that she buys her shoes at a small store in New York City that sells to drag queens. I asked for the address and went the next day. Taking all this into account, I’ve reviewed the seasonal weather of Shanghai. Beijing, Hong Kong and Guangzhou, these are the primary cities I’ll be visiting for business purposes. The weather in Shanghai is somewhat similar to Portland – cool in the fall, some days of very cold in the winter, wet in the spring and then unlike Portland, very humid in the summer. Knowing I will be unable to purchase anything in a store or online, I’ve developed a system of dress and have stocked up on my size 12 footwear. – I’m currently at a total of 3 large pieces of luggage and a fourth just for the shoes. I’m stuffing my golf travel bag with anything that doesn’t fit in my luggage. I have some comfort in knowing that I’ll be home throughout the year and I can always have my sister Katy, who also works for NIKE and comes to Shanghai for business trips, smuggle large size clothing and footwear into China. The visual of Katy being held in Customs due to excessive amounts of large size clothing and shoes makes me smile.